Demand for Aramco bond offering breaks records… Tops $85B | Watts Up With That? Alternate title: No… “The biggest Saudi oil field is [NOT] fading faster than anyone guessed”… Part Deux: Take your disinvestment and shove it where the solar panels don’t function. DUBAI—Orders for Saudi Aramco’s debut international bonds topped $85 billion, a record breaking vote of market confidence for the oil giant despite some investor concerns about government influence over the company. State-owned Aramco was expected to raise around $10 billion from the deal, which will be priced later on Tuesday and is seen as a gauge of potential investor interest in the Saudi company’s eventual initial public offering. Before the six-part bond deal was marketed on April 8, Saudi Energy Minister Khalid al-Falih said initial indications of interest for the paper were over $30 billion. Demand for the paper was the largest for emerging markets bonds since an orderbook value of more than $52 billion for Qatar’s $12 billion bonds last year, and surpasses $67 billion in demand for Saudi Arabia’s inaugural bonds in 2016. “Purely on figures, it is a fantastic credit, “said Damien Buchet, CIO of the EM Total Return Strategy, Finisterre Capital. The Aramco bond prospectus noted that Ghawar’s MSC (maximum sustained capacity) was 3.8 million barrels per day (bbl/d) in 2018. Based on Aramco’s definition of MSC, it’s difficult to determine if that is a current value or an average value over the Saudi planning period (which appears to be 50 years). A 2% decline rate, typical of giant oil fields, fits a current MCS of 3.8 million bbl/d. A 1% decline rate fits a long-term average MCS of 3.8 million bbl/d. People have often asked, “How could Saudi Arabia ever replace Ghawar, the largest oil field in the world?” They already have replaced it… and Ghawar is not “fading faster than anyone guessed.” It’s declining as gracefully as befits the world’s super-giant oil field. Based on past production and current proved reserves, I think the decline rate is probably around 2% (I will explain this in a future post). If Ghawar has declined to 3.8 million bbl/d, it would now be the second biggest oil field in the world, but only if you consider the Permian Basin as a single oil field (I don’t). 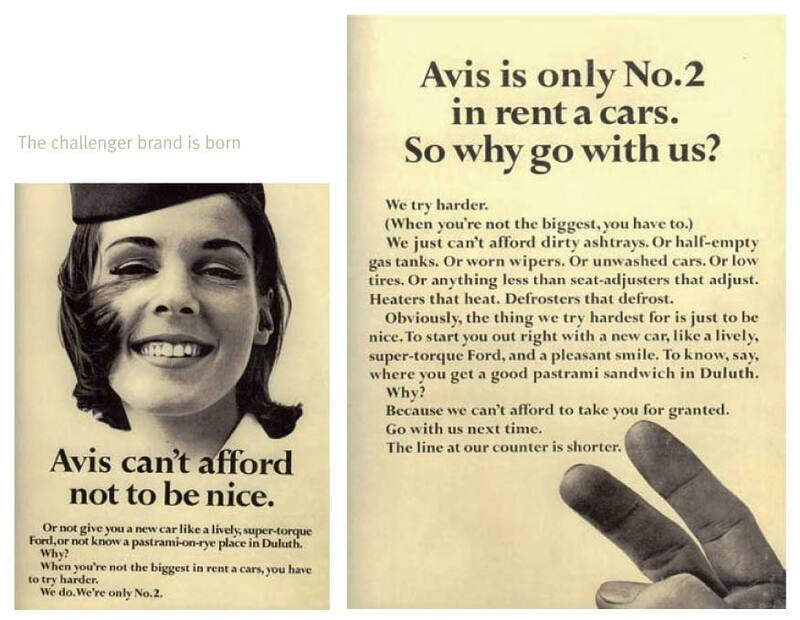 What was the old Avis slogan? Saudi Aramco clearly seems to be trying harder. Part three of this series will be a more detailed look at Ghawar. If the Saudis had been concerned about reserves, production costs, or production rates they would have curtailed the burning of crude oil in power generation plants long ago. They don’t move fast on anything but I think that and all the free stuff for its citizens was still a good indicator of resource pressure or lack thereof. Correct me if I’m wrong, but all that oil comes from squished vegetation does it not? Which means that where there is now desert, there used to be lush and plentiful vegetation. And whilst I understand tectonic plate movement influences the location of many things, would it be sufficient to shove a trillion billion barrels of oil under a sand dune? Was Saudi Arabia once a lush forest, like many other equatorial regions? I have no idea where I’m going with this. Brain addled with the Democratic betrayal that is Brexit. Really! Where are the Bedouin tribespeople setting up tents to stop oil pipelines? Oh yeah … they were paid-off a long time ago. Perhaps here in the States, we should issue monthly checks to the “indigenous peoples” … what’s that? They already receive monthly Govt. checks? Oh well … then I guess they have lots of free time to bang the drum in some random HS Freshman’s face. In terms of conventional reservoirs… Yes, there is that much more oil in the Middle East. In terms of unconventional reservoirs, the vast majority of the resource potential is in North America. And then of course, Alberta, which is the Athabasca of bitumen, and Venezuela, which is the Orinoco of extra-heavy oil. In Late Jurassic-Early Cretaceous times, Gondwana was split apart, and as rift volcanism and sea-floor spreading developed, ocean temperatures rose and ocean waters were enriched with nutrient elements from volcanic outpourings (along mid-ocean ridges and continental margins or island arcs). Oxygen-isotope analyses of marine limestones have shown that 125-85 Ma was a time of severe global warming due to a rapid increase in atmospheric carbon dioxide concentrations (mainly from increased volcanic activities). This is consistent with sequence stratigraphic evidence for sea-level maxima in mid-late Cretaceous times. Warm climate, high-stand seas and increases in the nitrogen-phosphorus-carbon contents of oceans, in turn, led to a profuse radiation of plankton populations – a key factor in the organic richness of marine sediments laid down during that period. Neo-Tethys most benefited from these events and the Middle East was in the right position at the right time. Well… He is an academic. It is just not a “pity”, David, …… it is a downright shame and embarrassment …. to/for themselves, …….. especially for the science learned individuals. They have been told different, shown different, proven different ….. via facts, evidence, logical reasoning and proxy records such as HERE, and HERE, and again HERE, ….. yet they persist to subconsciously mimic, cite and/or reference their nurtured “religious beliefs” …. without consciously realizing the “err” of their actions. Like the person who utters dastardly curse words in public but only realizes what he/she said after they said it. Which is proof-positive the is no such thing as “Free Will” that permits one to make conscious decisions. So, check out my cited proxy graphs and you should note the Period from 125 to 85 Mya the CO2 was rapidly DECREASING, …… not INCREASING. And that’s what did the dinosaurs in . And so is Michael Mann. And my point is/was, you shouldn’t have quoted commentary that contained blatantly false info/data if you knew it was “blatantly false”, ……. unless you SPECIFICALLY denoted the part or portion that you disagreed with, ….. otherwise, …… viewers are likely to assume you agree to the quoted text in total, …… as did David Chappell. …. and why not …..
“DUH”, I sure wouldn’t have chosen that author as the source to be quoting much of anything. I was educated to be an Educator of the Biological and Physical Sciences, and as a Degreed Professional, I still strive to act in a professional manner in all things associated with the science of the natural world. I didn’t quote it when I linked to it. HotScot asked about why there was so much oil in the Middle East. The article explains why. It was then that I quoted the passage and pointed out that CO2 was actually declining at the time of Cretaceous warming. 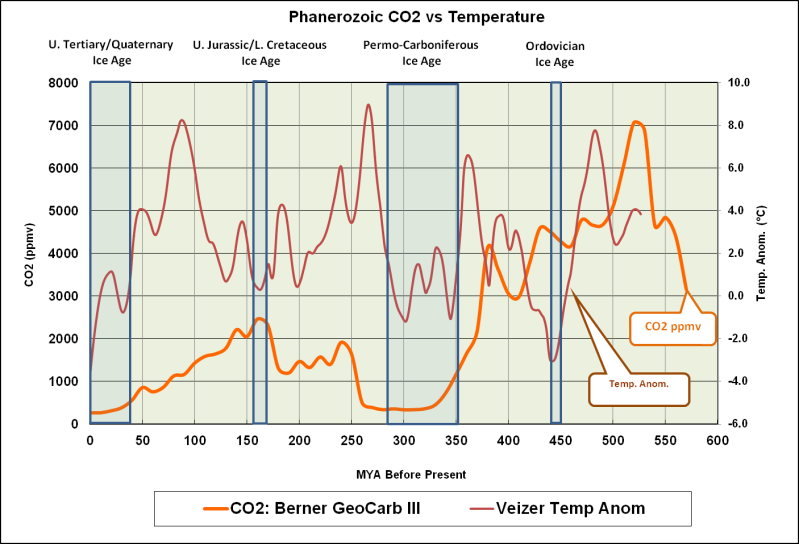 It is almost impossible to find a recent publication by an academic that doesn’t assume CO2 was the primary climate driver over the entire Phanerozoic Eon. The single phrase in the article is irrelevant to why there is so much oil in the Middle East. It was hot and CO2 was high; relevant factors in the depositional environment. Whether or not CO2 is related to the Cretaceous warmth is irrelevant to the geology of the Middle East. To explain these rich source rocks we need to consider the position and extent of the Neo-Tethys shelf during Jurassic and Cretaceous times. Neo-Tethys was then located close to the warm, organic-rich Equator; it possessed a broad 2,000-3,000 km-wide shelf and a length of at least twice that (Murris, AAPG Bulletin, May 1980). Moreover, Neo-Tethys was triangular in shape, pointed (thinning) toward the west; it was thus a partly enclosed basin with its wide shelf oriented almost west-east, and in a favorable position to benefit from organic-rich sedimentation processes and high stand sea-levels. Everything else is literally “written in stone” (it’s in the rocks). @David Middleton – In the comments section of a recent post, someone else linked to geoexpro.com, and I found the destination article fascinating. You responded something like “+2” to geoexpro.com. Having read a few posts there (including the one you linked above), I agree wholeheartedly. My field is space launch system engineering (my specialty is rocket propulsion), so I am not up to date on fields far removed. The posts at geoexpro are impressively written, and leave me with the feeling of having learned a lot (your posts here are the same, by the way). I’d be interested in knowing what other sites, specifically on petroleum and geology, you find worthy. All of the Hart Energy publications are good. Offshore, World Oil, E&P are good… But GeoExPro focusses on geosciences. AAPG Explorer and SEG Leading Edge are also good, without being too technical, but require memberships. Has anyone done a calculation on just how much biomass was required to produce the total amount of hydrocarbon reserves found in these formations? Is the existence of that much biomass within the necessary time constraints of the formation of source rocks actually possible? A typical oil reservoir has a recovery factor of ~300 barrels per acre*ft. The volume of organic carbon-rich sediment in the Earth’s crust is massively large. The Gulf of Mexico has accumulated more than 60,000′ of sedimentary column over the last 200 million years. The Cenozoic section, alone, is more than 40,000′ thick in places. 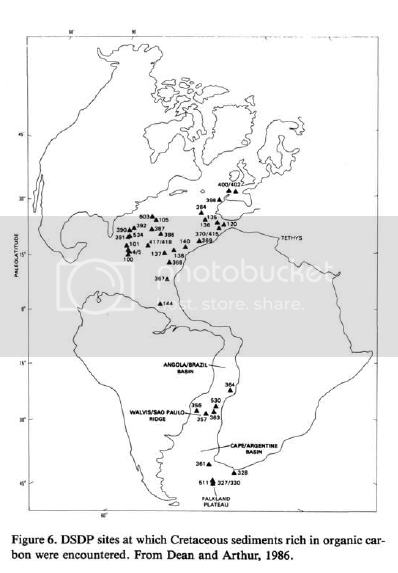 The Quaternary can be more than 30,000′ thick in some locations. 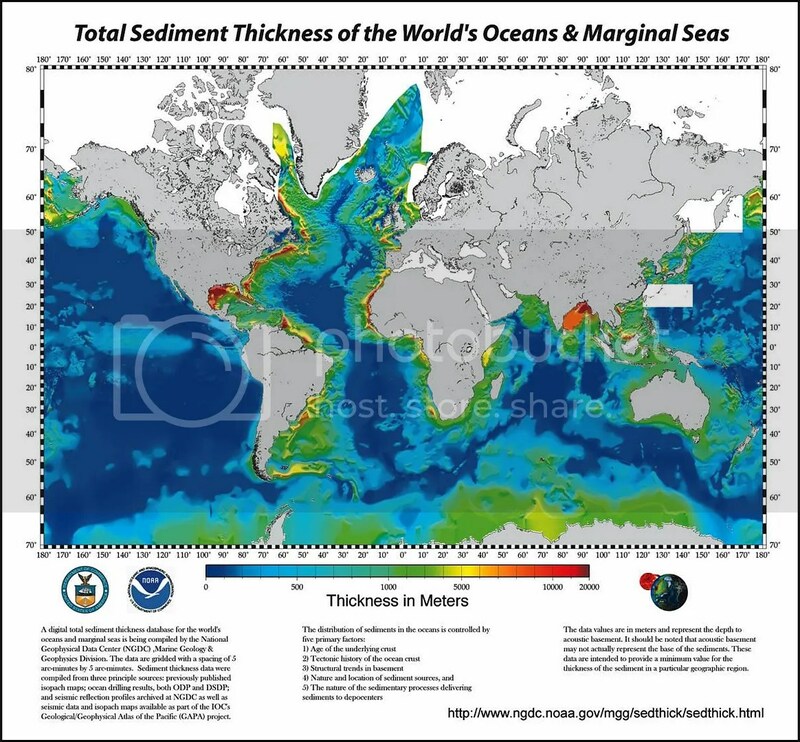 Most of the sedimentary column is composed of thick, organic-rich shale.Oil is still being formed and migrating from source to reservoir rocks in the Gulf of Mexico. The Pleistocene reservoirs are less than 2.5 million years old and many have only been charged over the last 275,000 years. The reservoirs simply aren’t being charged as quickly as we are producing them. Red areas indicate ~20,000 meter sediment thickness. Total organic carbon (TOC) averaged 10% by weight. The Lower Tertiary Eocene was also a hydrocarbon kitchen (up to 21% TOC). There is no shortage of organic matter in the sedimentary basins of the Earth’s crust. I don’t know if anyone has ever tried to match up the volumetrics of source and reservoir rocks… I don’t think that’s even possible. And it really wouldn’t matter because “oil is where you find it.” Oil has to be produced from economically viable accumulations. Prior to the “shale revolution,” that was pretty well limited to porous and permeable sedimentary rocks (sandstone and carbonates). Shale plays directly tap the thermally mature source rocks, which tend to have very low permeability. The Lost City hydro-thermal vent in the Mid-Atlantic appears to be an actual example of the Fischer-Tropsch process. In addition to abiotic methane (not uncommon), minute traces of heavier hydrocarbons have been detected, possibly even octanes. It’s interesting… But not even remotely close to producible oil. This all just goes to show how successful the disinvestment campaign against fossil fuels is going. 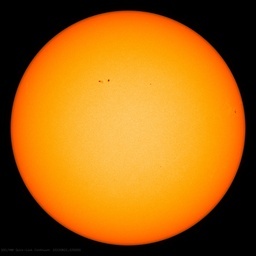 Bill McKibben is probably throwing a tantrum… if he is even aware of this. Don’t worry, regardless of whether Weepy Bill McKibben is aware of this or not, he is surely throwing a tantrum. Indeed. When isn’t the weepy one throwing a tantrum? In a related story … CALPERS and CALSTRS continue their “socially conscious” investing which continues to lag behind the roaring stock market ofvthe Trump economy. Ensuring a State of CA taxpayer bailout coming soon. Work HARDER all you socially conscious millennials … keep the Boomers FAT$$ pension$$ flowing! David M. please tell HotScot where oil is synthesized. You were kind enough to give me the link to an old WUWT article but I can’t resurrect it. Many thanks. Aramco shoul tremble. The Synod of the Church of England is continuing its pointless virtue signalling towards a ‘carbon free’ future by disinvesting in fossil fuels. The stupid ignorant deluded prelates should go and cook on twigs and dung and die of inhalation. As the saying goes….. follow the money. OT …but amazing. Just listening to The Five on Fox. Evidently New York City has passed a law which allows any person to report on an idling truck, if that truck sits at idle for over 4 minutes. The person has to verify the entire episode with video, and then they get a reward for reporting the idling offender to the city. The reward can be several hundred dollars or higher. One stalwart well dressed fellow is shown filming a school bus sitting at idle. Which made me wonder what if you were to have a set up with the driver where the driver of the offending truck/bus gets a pieces of the action? Pay the driver 50 bucks say to go get a coffee or a bathroom break. The well dressed older man claims to have made as much as 9,000 dollars in a month performing this uncivic duty. Misheard the money the one man made. It was 9,000 dollars total since the new law went into effect last year. The biggest Saudi field is flooded with sea water. Yeah, they can pump a lot of sea water, but the amount of oil is sparse. That is why their export volume is declining. It is not domestic consumption, it is production decline. $85 billion? Hey Ho, Way To Go Aramco! David, what is your opinion on the announcement from Norway? I think you hit on it with your response to the Bloomberg article but I can’t find it. I am sure you covered it. The article gets almost everything wrong. Norway is not “walking away from billions of barrels of oil.” There clearly is resource potential in the Lofoten islands; however the area has never been drilled. It’s disappointing, but not surprising. Norway awarded on Wednesday 10 new licenses for offshore oil and gas exploration in the Barents Sea, including three in previously untouched waters near the Russian border. The Oil Ministry said it is the first time new acreage has been opened for drilling in Norwegian waters in 20 years. [W]ith production declining at its North Sea fields, Norway has encouraged exploration of ice-free waters in the Barents Sea, to continue oil and gas exports that have made it one of the richest countries in the world. Two fields are in production in the Norwegian part of the Barents Sea – the Snøhvit gas field and the Goliat oil field. The Johan Castberg field is being developed and will start to produce in 2022, according to plan. Several discoveries have been made that are relevant candidates for development, and there are still considerable undiscovered oil and gas resources. The companies must explore if these resources are to be proven. The Norwegian Petroleum Directorate expects that as much as 65% of the undiscovered resources on the Norwegian Shelf lie in the Barents Sea. “Significant values have been created from the petroleum activity in the Barents Sea. To date, around 155 exploration wells have been drilled there, and the NPD’s resource report for exploration (2018) revealed that every $116.89 (1000 kroner) invested in exploration in the Barents Sea has yielded $245.46 (2100 kroner) in return,” emphasizes Director General Bente Nyland. That’s quite a bit different to what is being spat out across Aussie MSM, but not a surprise. Well it is election year, a few weeks away, and everyone is short stroking electric cars now.